Today’s photo the day is another image I made during our holiday to Uepi Island Resort in September 2009. From time to time they have a shark feed hear, at the “Welcome Jetty”. As someone who believes in protecting sharks, and also creating an appropriate understanding of them and their importance to the ocean’s eco-systems, I must admit to being in 2 minds about shark feeds. Uepi’s policy on shark feeds, and the way they conduct them, is quite sincere. Their belief is that the shark feeds have helped to rebuild healthy shark stocks in the area, and it is also an environmentally friendly way of disposing of some kitchen waste (important given their remoteness). Given that there were 20-30 sharks on each feed, and regular sightings on many dives, I’d have to say they seem to have been successful in this. They only allow 2-3 people in the water at a time, and those people must stay completely under the welcome jetty. The feed is tossed away from the jetty, and a distance to keep guests out of the melee (it is a true frenzy), but close enough to allow some photos. 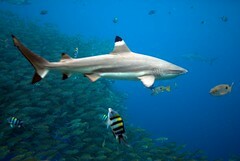 Many of the sharks will break off from the frenzy and circle around to take a look at us, but never were we threatened. Since the shark feed was happening anyway (twice during our 10 day visit), I couldn’t let the opportunity go to waste, and jumped in the water and took photos. Belinda also took photos with our other camera from the jetty. I’ll post some of those images later. This image shows the enourmous school of fish that congregates near the jetty – constantly. They did not appear troubled by the feeding of the sharks, although they did move to stay out of the way of being in the line of fire! This image was from the first shark feed. I didn’t have my mind around natural light photography, and the fast moving pace, so was shooting manual. In retrospect, I should’ve been in shutter priority mode (a mode I almost never use underwater). So many of the images weren’t exposed well, or were blurry. This one has been corrected “in post” to get the colour exposure back. On the second dive (I’ll be sure to post images to the BlueBeyond Flickr gallery later), I had the right shutter priority mode, but wouldn’t you know it, the water was much greener and had a lot sediment in it. I’m still in 2 minds about shark feeds, but they do make great photographic opportunities!